Go Green - Give Green! Give a friend a free membership! That's right folks, it's that time of year again! 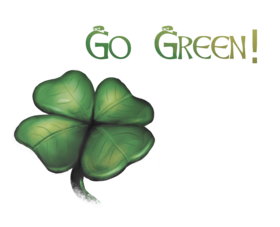 With Saint Patrick's Day just around the corner on Saturday, March 17th we are running our annual Go Green - Give Green Community Supporter drive, and here's how it works. All you have to do is purchase or renew* your full year CS subscription, and then send a PM to me, Birched, telling me which deserving Please only gift to folks who are not already green.Non-CS member you wish to give 3 free months of Community Supporter subscription to. Also please let me know if you want your gift to be a secret (anonymous) or not. That's it! It's just that simple! We will take care of the rest and make sure that the lucky recipient gets to try on their shiny new green username, and all the perks** that come along with it! *Remember that just because your subscription isn't due, doesn't mean you can't add to it at any time! To check the expiry date of your CS account, please visit the subscription page. Opportunity to play the Community Supporter Exclusive Adventure - available in 3.5e, 4e and Pathfinder! P.S. To purchase a gift subscription, please purchase a CS for yourself as usual, then pm Birched with the exact name of the person for whom you are buying the gift, AND another person to whom you wish to give the 3 month "give green" subscription. The one year subscription will then be transferred from your account to the intended recipient.